Quito, Sep 4 (Prensa Latina) The Ecuadorian coastal city of Guayaquil will host the 4th International Book Fair, scheduled from September 5 to 9 at the Convention Center. With Spain as the guest country, the event will be attended by six Spanish authors: Javier Sierra, Juan Manuel de Prada, Javier Moro, Elena Medel, Maria Elvira Roca Barea, Miguel Gane and Nerea Perez de las Heras, who will present their books and will participate in colloquiums. More than 600 titles from major publishing houses and a selection from the publication service of Spanish Cooperation will be available at Spain's stand. The fair will also be attended by the authors Carmen Boullosa and Julian Herbet (Mexico), Ariana Harwicz and Rocardo Liniers Siri (Argentina), Giuseppe Caputo (Colombia), Frank Baez (Dominican Republic) and Alberto Montt (Chile-Ecuador). According to organizers, the main objective of the fair is to promote reading as a practice to train the personality and citizenship of Guayaquil residents, as well as attracting new regular readers. In addition to the commercial fair, those visiting the Convention Center of Guayaquil will enjoy literary zones, areas for children and youths, contests and other activities. The Colombian president has said a letter has been sent to the Union of South American Nations (UNASUR) announcing his country's withdrawal, meaning Bogota will officially cut loose from the bloc in six months. Newly sworn-in Colombian President Ivan Duque announced on Monday that his country has started a formal withdrawal process stipulated by the organization's constituent treaty, that begins with a member-state sending a written notice to the bloc's headquarters. "Today with precise instructions, the foreign minister sent UNASUR the letter where we denounce the constituent treaty of that entity and in six months our withdrawal will be effective," Duque announced in a brief televised statement, as he followed through on his pre-election pledge to get Colombia out of the bloc, which was originally intended to foster regional integration and counter US influence when it was founded in 2008. Right-wing Duque, who took office on August 7, had previously indicated that Colombia's departure from the 12-member organization was imminent. Announcing Colombia's withdrawal on Monday, Duque claimed that the bloc of nations had failed to address a political crisis in Venezuela, which has been rocked by a wave of anti-government protests and the attempted assassination of President Nicholas Maduro earlier this year. 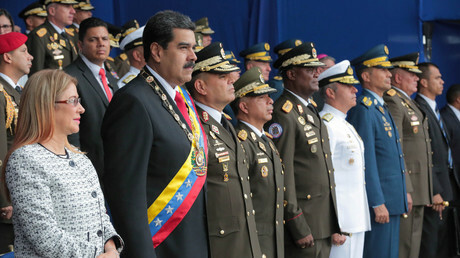 Echoing the rhetoric of the US White House, Duque has labeled the Maduro government a "dictatorship"; he has also called the UNASUR Maduro's "greatest accomplice." Colombia became the first and, so far, the only one of the organization's 12 members to formally leave UNASUR. In April, six countries –Argentina, Brazil, Chile, Colombia, Paraguay and Peru– suspended their membership for a period of one year, citing differences over choosing the group's secretary general. Venezuela, Ecuador as well as Guyana, Suriname and Uruguay continue to remain full members of the bloc. Prior to Colombia renouncing its membership, Bolivia urged Duque to reconsider his position, hailing the group as "the natural space of integration that constitutes the hallmark of the peoples of the South because we are united by our history and by Mother Earth." Caracas, Jul 28 (Prensa Latina) The head of state and president of the United Socialist Party of Venezuela (PSUV), Nicolás Maduro, called on the militancy to focus the debates of the 4th Congress of the political organization on the economic issue. Through a message on the social network Twitter, the president stated that the great appointment of the organization, starting today until July 30, will contribute in its discussions to define the future of the South American nation. 'The 4th Congress of the PSUV has as a method the dialectical equilibrium of reflection, study, thought and action, to make definitions of the future of the country. I insert in the debate (...) the Program of Recovery and Economic Growth of the Country,' Maduro wrote on the platform. 'I am sure that with the unity of Venezuelans, a new model of development of the productive forces will emerge, capable of creating wealth and producing everything we need for the functioning of society and the satisfaction of the needs of the country,' added the socialist leader. From today, 670 delegates from all the Venezuelan states will discuss the most pressing issues of political and economic news, in a process of discussion that started from the bases of the main party organization of the nation. Lawyer Rogelio Benitez said: "Ten years await Lugo for having attempted to act against the constitutional organs of the Republic. Lugo is a citizen who believes himself to have superpowers, beyond the constitution." Duarte Frutos and Cartes, two leading figures of the ruling conservative Colorado Party, are accusing the leader of the progressive Guasu Front of ignoring the votes of Colorado Party candidates. The legal complaint claims that Lugo, as president of Congress, "assumed functions that don't correspond to him, bypassing constitutional dispositions, practically bypassing the Supreme Court and Electoral justice and all overseeing laws." The Guasu Front responded to the accusations by saying the "Colorado Party seeks to violate the institution's integrity" and vowing that it "will not cease against the pressures of political groups... who use and abuse state structures with impunity." The Guasu Front reiterated its "full support to comrade Senator Fernando Lugo that has kept firm in his position of not transgressing in any way in his position with regards to the dictates of the National Constitution." The Guasu Front also reiterated its commitment to "clean the judicial structure of the country." Fernando Lugo was a Catholic Bishop associated with liberation theology who assumed presidency of the Guasu Front in 2008, ousting the ruling Colorado Party. In 2012, he was impeached in what many called a 'constitutional coup.' The coup was condemned by progressive leaders, including Argentina's Cristina Fernandez, Ecuador's Rafael Correa and Brazil's Dilma Rousseff. Lugo was later elected to the Senate in 2013. “An enormous challenge has arrived; the manipulation of the justice system with the payment of political favors is evident," Rivadeneira said. Leader of the Citizens' Revolution movement, and former leader of the National Assembly of Ecuador, Gabriela Rivadeneira, has said that the justice system is being manipulated to wage a political war against former President Rafael Correa and the movement he led. “The hardest hit is the effort to diminish, de-legitimize, not only the leader of the Citizens' Revolution, but an entire project that began from below, that had strength for ten years, that had made itself one of the biggest political forces of our day. This is what they want to end through judicial processes because they can't arrive to power through the popular vote,” Rivadeneira said in an interview with teleSUR's Enclave Politica. Rivadeneira, a key Correa ally, said that the current government has reversed the gains of the Correa administration. Ecuador's chief prosecutor requested a preventive detention of Correa for supposed involvement in a kidnapping, charges which he vehemently denies and says there is no evidence for. "These are people who would be capable of accusing their own mothers to obtain benefits," the former president of Brazil writes of his accusers. Former President of Brazil Luiz Inacio Lula da Silva, sentenced to over 12 years in prison for alleged corruption, requested the Workers' Party (PT) to release a letter affirming his pre-candidacy for the presidency, and challenging his accusers to present evidence against him. "I have not committed any crime. I repeat: I have not committed any crime. For this reason, until they present at least one piece of material evidence that throws into question my innocence, I am a candidate for the presidency of the Republic," the letter reads. The letter asks that his political adversaries present said evidence before August 15, when he will be registered formally as a candidate before the Electoral Justice. "I am not asking for a favor, I am demanding respect. During my whole life, and I am 72, I believed and preached that sooner or later justice would always prevail for people who are victims of irresponsibility of false accusations," it continues. "I am beginning to have dramatic and cruel doubts over continuing to believe that justice can be served and refusing to participate in a farce." According to PT President Gleisi Hoffmann, who has read the letter, the PT hopes to avoid speculation that an alternative candidate could arise. Lula emphasized that no evidence exists against him, and that the entire case is a massive lie initiated by a false report by the media outlet O Globo, which claimed he had engaged in money laundering and corruption. "O Globo newspaper published a lie that attributed the ownership of an apartment in Guaruja to me. The Federal Police reproduced this lie and started an investigation," Lula writes. "The Public Prosecutors, receiving this same lie, made an accusation and, finally, always on the basis of this lie which was never proven, Judge Moro condemned me. "The 4th Regional Federal Court, following the same script that began with a lie, confirmed the conviction. All of this leads me to think that there is no reason to believe that there will be justice. "These are people who would be capable of accusing their own mothers to obtain benefits."